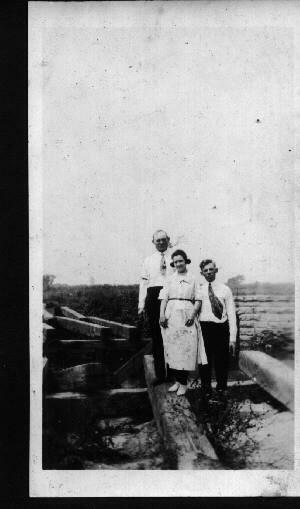 Mary Rosalia Patz (also known as "Mae," "Mayme," and "Mary Ann") was born on May 27, 1894, in Buffalo, NY. According to Robert, her son, Mary never went beyond grade school at St. Boniface in Buffalo, NY. Later in life, she had to seek out a Catholic Church where the priest could hear confession in German because she knew all of the prayers in German, and not in English. 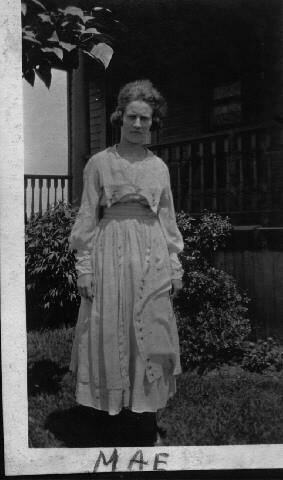 For a time, Mary worked at the Rome Wire factory and then in a weaving or textile mill. 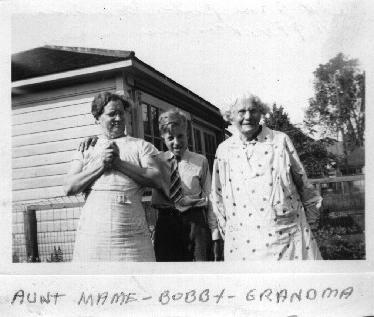 Photographs exist of Mary and a group of fellow workers in their work uniforms. The various 1916 to 1923 Buffalo City Directories list Mary as having various job descriptions: silk winder, silk weaver, cutter, and clerk. 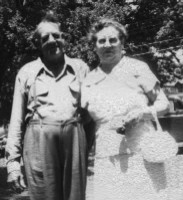 After their marriage, Otto and Mary lived in various homes around the Broadway and Fillmore section of Buffalo most of their lives. 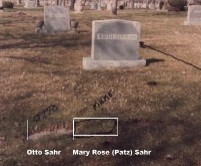 She now rests next to Otto in the Veterans plot in the (Old) Buffalo Cemetery. 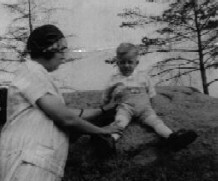 Otto and Mary (née Patz) Sahr. Otto Wilhelm Sahr was born on October 21, 1892. 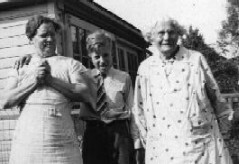 Otto had three brothers (Elmer, William, and Carl) and three sisters (Elizabeth, Ella Minerva). He served in the Army Infantry during World War I and was in combat in France for 17 months with Company K, 7th Infantry at Bellow Woods, Chateau Tierry and near the Argonne Forest, until the Armistice. He was also in some gas attacks and was affected by it for the rest of his life. In Otto's early life, as he reported to his son Robert, he was very good at playing pool. He apparently never bought a drink in a pool room and told Robert that he once played at the Hippodrome Pool Parlor on Main Street in Buffalo. This is where the really excellent players would gather. Otto almost wet his pants from the nervousness. Otto also tried his hand at singing by performing at amateur shows. 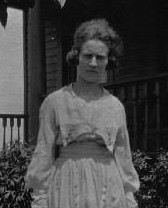 Otto worked for Pierce Arrow in Buffalo until the Depression. He then went to work painting houses etc. that the banks would repossess. He would carry a 50 pound can of white lead paint and some colored pigment tubes to the job and mix his own paint to the color the customer wanted. Later in his career his fellow workers would assign him to paint the islands in gas stations and lower areas so he wouldn't have to climb ladders. Otto remained a heavy smoker until his death on September 25, 1964. Mary died on June 30, 1971. Both are interred in Section O, Lot 30 of the Veterans Area of the (Old) Buffalo Cemetery (Pine Hill) on Pine Ridge and Genesee Roads. 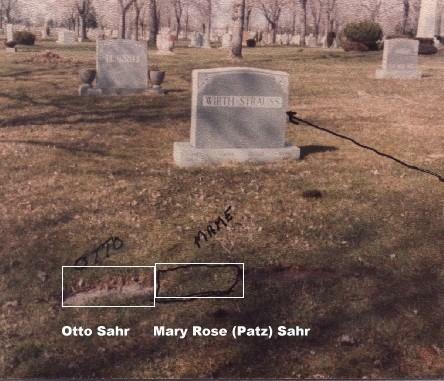 Otto's grave is marked by a headstone, but Mary's is not. Based on the memories of Robert Sahr, son of Mary Rosalia (née Patz) and Otto Sahr. 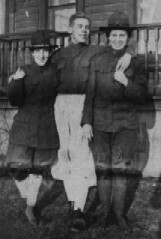 Clara (née Sawyer) Patz (wife of John Joseph Patz), Frank August Patz, and Mary Rosalia Patz. Clowning around in each other's uniforms. (No date). 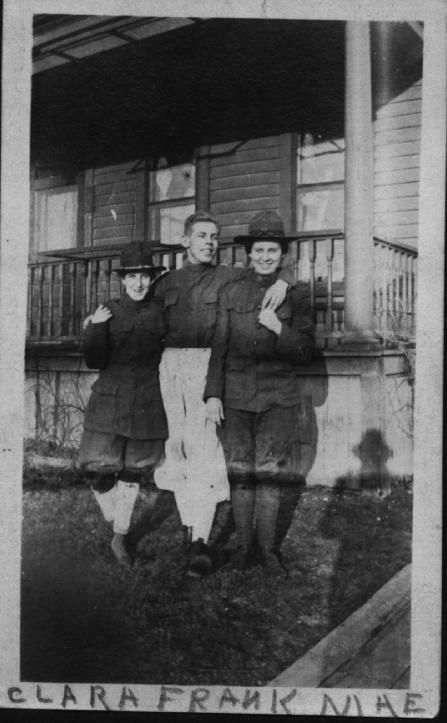 John Martin Patz, Mary Rosalia Patz, and Frank August Patz, 267 Colorado Street, Buffalo, NY. (No date). 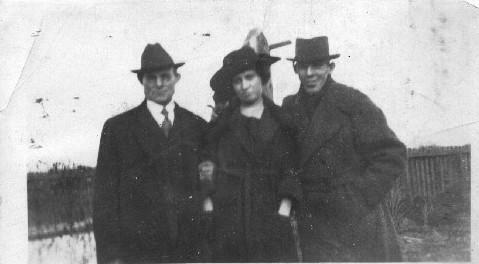 John, Mary Rosalia (née Patz) Sahr, and Otto W. Sahr. (No date). 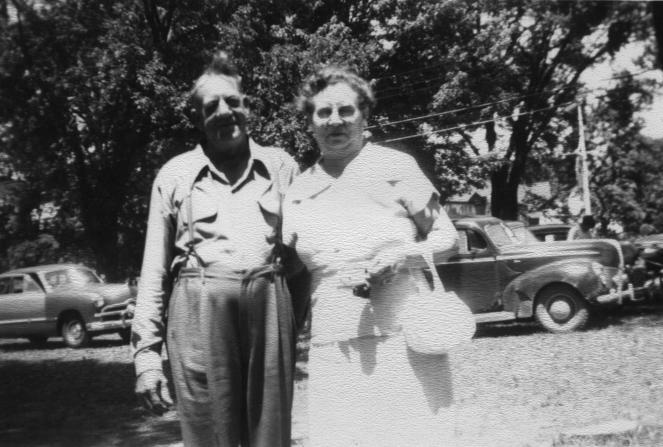 Mary (née Patz) and Robert William Sahr. No date. 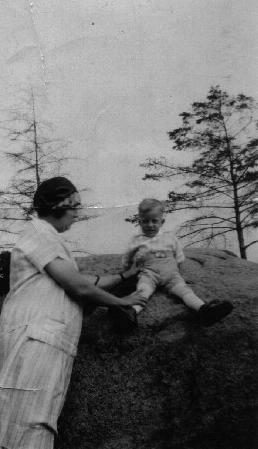 Mary (née Patz), Robert William Sahr, and Mary (née Schwert) Patz, 1938 or 1939. Robert William Sahr: Born 1925; died 2004. 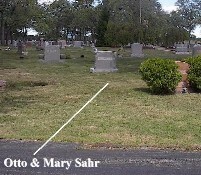 General location of graves of Mary Rosalia (née Patz) and Otto Sahr, Lot 0, Sec. 30, Buffalo Cemetery (Pine Hill), Cheektowaga, NY. 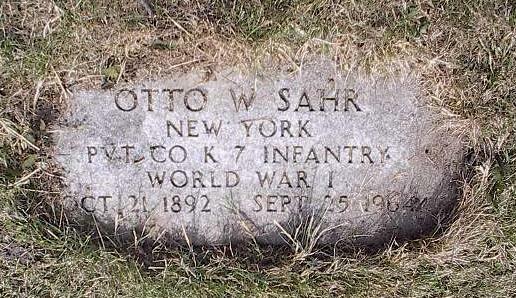 Grave of Otto W. Sahr, Lot 0, Sec. 30, Buffalo Cemetery (Pine Hill), Cheektowaga, NY. 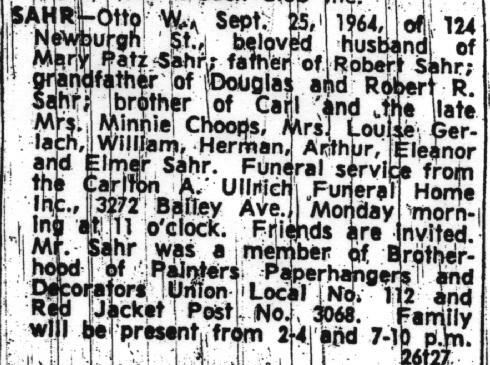 Obituary: Otto W. Sahr, died September 25, 1964. 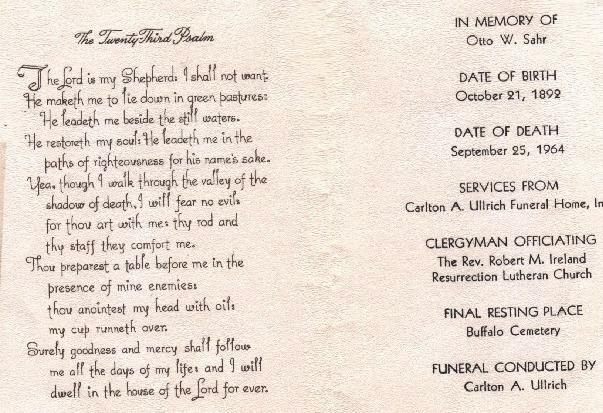 Funeral Mass Card: Otto W. Sahr, born October 21, 1892, died September 25, 1964. 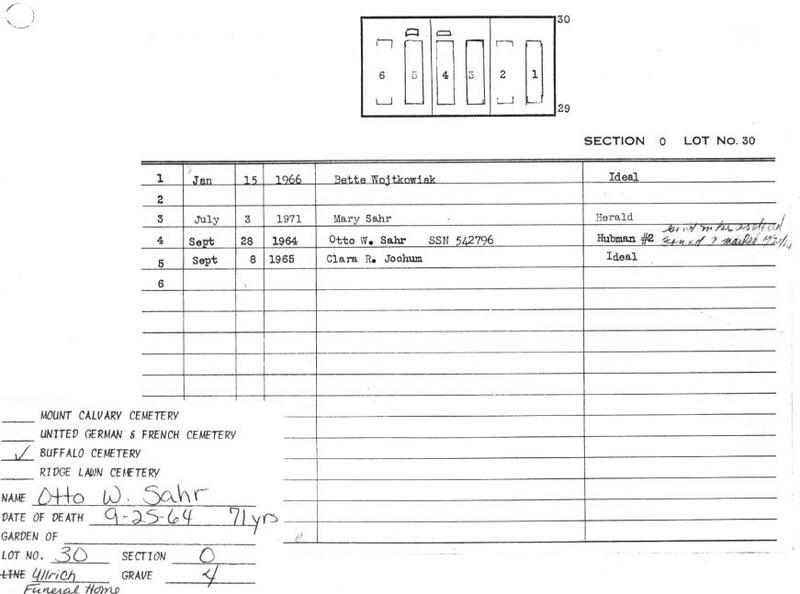 Interment Record: Otto W. Sahr, Sec. O, Lot 30, Buffalo Cemetery (Pine Hill), Cheektowaga, NY. 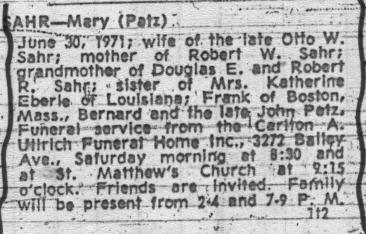 Obituary: Mary (née Patz) Sahr, died June 30, 1971. 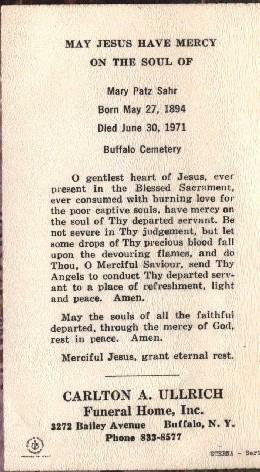 Funeral Mass Card: Mary (née Patz) Sahr, born May 27, 1894, died June 30, 1971. 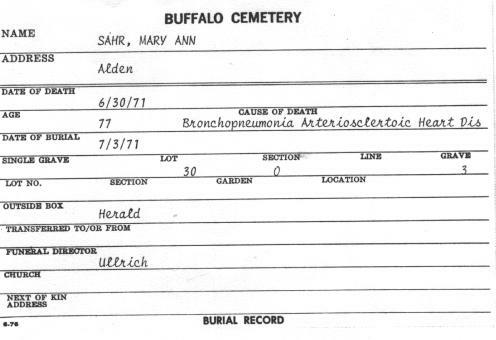 Interment Record: Mary Sahr, Sec. O, Lot 30, Buffalo Cemetery (Pine Hill), Cheektowaga, NY. 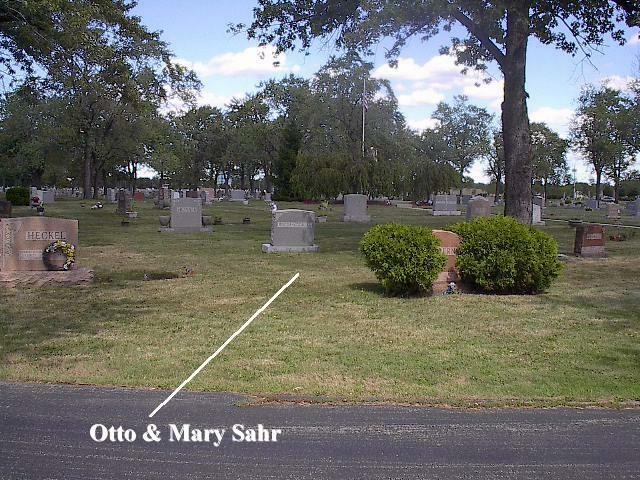 Cemetery Plot Map: Mary and Otto Sahr, Sec. 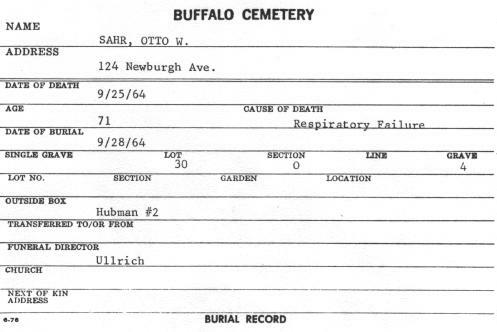 O, Lot 30, Buffalo Cemetery (Pine Hill), Cheektowaga, NY.